1 out of 8 women will be diagnosed with Breast Cancer during their lifetime. It is the leading cancer among women, and the second leading cause of death for women. Women are not the only ones at risk. While much less than the 200K women diagnosed each year, over 2,o00 men will also be diagnosed each year. I don’t recite these numbers as a scare tactic, but they help me to try to better understand a world or situation that really just doesn’t make sense to me. Remember, I am a Humanities person, not a science person, so these numbers tell me that almost everyone will be affected by breast cancer, whether it is our own personal battle, the battle of someone we love, or the battle of a co-worker. They tell me that we all need to be taking steps for our health, because the numbers also say that with early detection and medical advances, more people are surviving breast cancer! Cooking for a Cure might seem trivial when faced against these overwhelming numbers, but I am not a doctor. I cannot find a cure. I can donate to those who can, and I do. I can help raise awareness with my fellow bloggers and talk about the need for self-exams every single month. 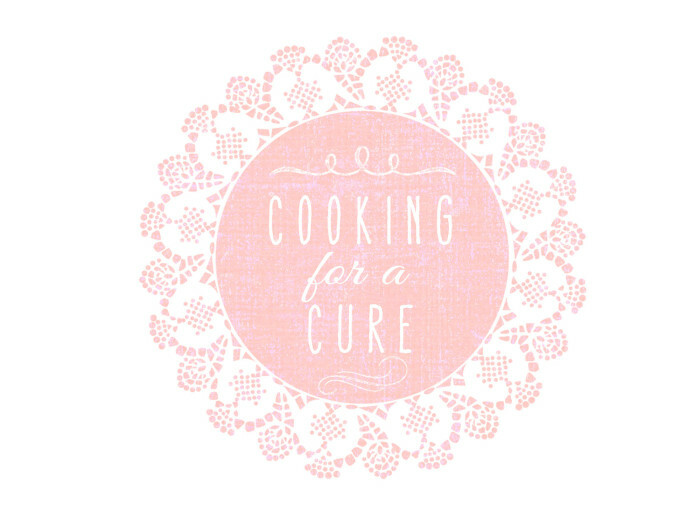 I can make a PINK recipe that will offer support and love to a friend battling and surviving breast cancer. I can remind all of you that making moments matter is always important. My husband and I have both known women diagnosed with breast cancer – family members and friends. Here is what I know: having a strong support system to battle a disease, whether it is breast cancer or something else, is essential. So while I dedicate this recipe to all the survivors and those currently fighting, I also dedicate this recipe to their loved ones and to their medical professionals for their constant support, endless love, hours of caregiving, days sitting in the hospital, and many sleepless nights. Surviving is not a solitary effort. 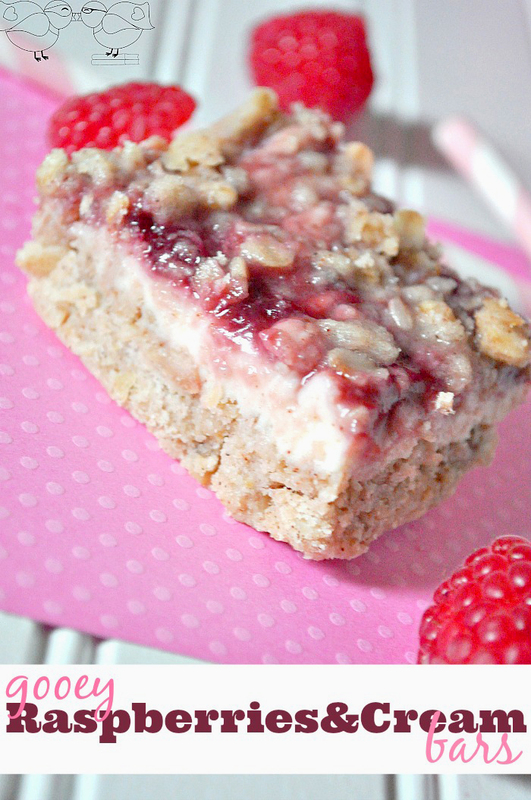 Right below you will see the recipe for these Gooey Raspberries and Cream Bars, followed by awesome PINK recipes from my blogger friends! 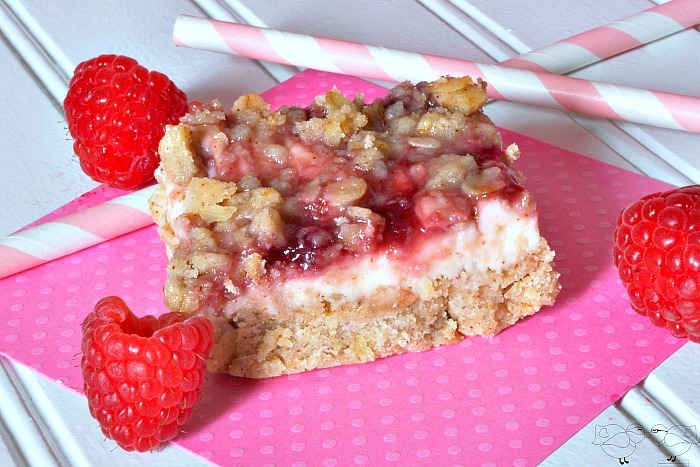 Ooey Gooey Raspberries and Cream Bars - Delicious desserts are worth a little bit of mess! Line an 8x8 pan with aluminum foil and coat with cooking spray. Mix together the flour, baking soda, salt, traditional oats, brown sugar, nutmeg, and cinnamon. Melt the butter and mix into the dry mix until well absorbed. Use your hands to get everything well combined. Take the mixture and press firmly into the bottom of the 8x8 pan, leaving just a little extra to sprinkle on top if desired. Bake the crust in the oven for 5 minutes. Combine cream cheese, sugar and vanilla in a bowl. When the crust has been removed from the oven, smooth an even layer of the cream cheese mixture onto the crust. Add your raspberry jam in an even layer on top of the cream cheese. Top off with remaining oats mixture if desired. When you remove from oven, let it sit for a few minutes to cool. Then, carefully use the aluminum foil to remove bars from the pan and place on a cooling rack. Win a Canon Camera for the Holidays! These looks super delicious and definitely perfect for a great cause! Oh yum! These look so good, I bet they’d be filling for breakfast too. Hmm. Thanks for sharing! I’d love if you’d stop by my blog and link it up. All of the posts get pinned. Happy Wednesday! What a great cause! These look yummy! Gorgeous! These are so pretty. I’m always looking for new recipes to wow my coworkers with, and I think this will have to be the next one. I agree with you and Amy above. We have to support the fight against breast cancer in whatever way we can. Maggie, these bars look amazing! I feel similarly to you–I’m not a doctor and can’t do anything all that great to help but I certainly can bake. I love that baking brings people together and brings such comfort. These bars definitely do!